I’ve written before about lack of detail made available when planning transport projects in Victoria, but the latest revelation at Ormond station takes the cake – halfway through removing the level crossing, the government has announced plans to build a residential tower up to 13 storeys high above the Frankston railway line. So what the hell is going on? Back in May 2014 the story starts, when the then-Liberal government announced a $457 million package of works to remove level crossings at Burke Road in Glen Iris, Blackburn Road in Blackburn and North Road in Ormond. The scope then expanded in early May 2015 when the new Labor government announced they would consider the removal of the Centre Road, Bentleigh and McKinnon Road, McKinnon level crossings, with contracts being signed a week or two later to complete the work. Initially the information made available was very sparse – diagrams such as this one of Bentleigh station wee all the public had to go on, with local resident and transport blogger Daniel Bowen had to fill in the gaps. Fast forward to May 2016 when initial construction was well underway, and detail was still sparse – again Daniel Bowen had to visit a public information session to see plans of what was being built. July 2016 saw work kick up a gear, with train services shut down for a month to allow all three stations to be demolished and the new railway cutting to be dug. But there was a new feature at Ormond station that wasn’t in the previous published plans – a extra concrete deck over the tracks. @Xtrackka noticed it a week ago. Labor flagged in Opposition that it would develop land as part of some level crossing removals to help pay for other transport upgrades, including extra station car parking and yet more level crossing removals. Ormond marks the first example by the Andrews government of this “value capture” approach. At up to 13 storeys high, the development would be much taller than any other building in that part of Melbourne, which is low-rise in character. The building, which the government said would also include ground level shops and restaurants, would have to pass the usual planning hurdles before being approved. 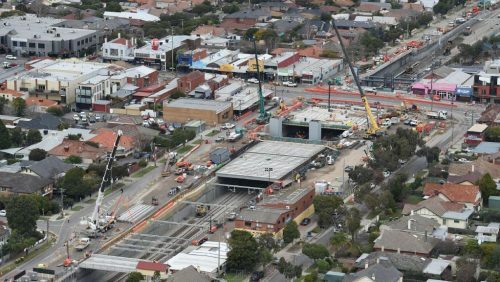 Just south of Ormond, Bentleigh and McKinnon stations are also being rebuilt as their level crossings are removed, and land has also been set aside there for future development. The government said developments at those two stations would be smaller in scale, in keeping with the village atmosphere. 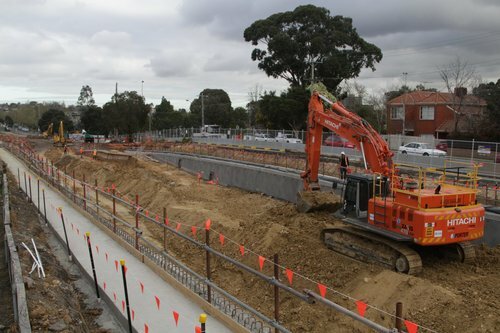 Luke Donnellan, the acting public transport minister, said the Ormond station site on North Road was well suited to larger-scale residential development, given North Road was a busy six-lane arterial. “This location is ideally suited to new homes and businesses – in the heart of a vibrant community, directly connected to transport, shops and opportunities,” Mr Donnellan said. The government estimates the development will create 250 construction jobs and 300 ongoing local jobs at businesses that would occupy the new building. The government has plans to remove 50 level crossings by 2022, and these three in Ormond, McKinnon and Bentleigh are among the first. There are also plans to build a new tower at Gardiner station in Glen Iris, where the Burke Road level crossing was recently removed, the government said. My take – Ormond station is a perfect area for higher density development given the good transport links, and the lack of immediate neighbours to be overshadowed – the issue is they way that the government keeps on suddenly releases these plans to the public, amplifying the opposition from local residents. The government is supposed to be planning for the future of the city – not organising a bloody surprise party! That is the problem with Australian governments in a nutshell – no significant future planning, they simply make it up as they go along. It’s what to expect with Labor and don’t be fooled, no money will be re-invested into other infrastructure like further crossing removals. Hi there! I have no problem of Hong Kong style development around railway stations. Make the train stations high activity areas instead of quiet and dull places. Some of the buildings around Melbourne train stations are pretty ugly and boring to say the least at the moment. The French style of buildings with shops, offices and apartments, around railway stations would be great as well. I am just wondering was it necessary to build 3 platforms at the new Ormond, McKinnon and Bentleigh stations instead of a Laburnum style station where the expresses could run down a centre track while the side tracks use the side platforms for stopping all stations trains? The third platforms from Glenhuntly to Moorabbin seem to be wasted most of the time and are hardly used! Level crossing removal projects make only token efforts to improve rail infrastructure, and often ignore future enhancements such as track amplification. Third tracks only allow for express trains in one direction, while limits their usefulness – provision for four tracks through the upgraded Ormond, McKinnon and Bentleigh stations would’ve made sense. I guess its the speed of the program, where they dont actually have plans until just before building ! Though in this case not even announcing a 13 storey block of apts as a possibility is a shock…. well actually smart move in that the opposition would have been severe, so it wouldnt have happened. Still might not, though if state govt wants something they can just make it so ! I agree these trench crossings should be used as an opportunity for building stuff on top, though I was thinking really just rows of shops or more carparking or parks, lightweight stuff not expensive to support – in fact I dont see how 13 storeys can be held up here…does the deck have central supports ? Maybe the loads from the building above will be transmitted outside the rail cutting? I believe the deck at Ormond consists of deeper than normal concrete ‘super T’ beams. So, what planning hasn’t been followed? Melbourne has had strategic level planning policies in place since at least 2002 that have indicated a preference for intensification around stations. Many planning and design academics have lamented the lack of such development in Melbourne, reports have found the strategic policies to have failed. But they never went away. Now, presumably, like everything else, these projects will be subject to processes of development control that is normal planning practice for Melbourne. Now, *if* such a development were to be announced as a fait-accompli, without being submitted to the relevant authorities for a planning permit, that would be different. The real question here is: In such cases, what is the relevant authority (or authorities) for giving planning approval to this kind of project? And what are the processes that must be followed? You’re correct about the usual planning processes needing to be followed for any future development at Ormond, but the difference here is how a new development site has been created out of thin air. Any large suburban brownfields site in close proximity to a railway station is a candidate for future development – my suburb has a few, and I’m expecting something tall to be built on each of them once the market catches up. At Ormond the government went into the level crossing removal project saying “you’re removing a level crossing and building a new station” then halfway through building it, they’ve said “and you’re going to put apartments on top of it as well”. This is becoming so typical of this labour government. They are so sneaky and they knew it would cause an uproar. Don’t bother consulting with the residents or the local community but keep it hidden as long as possible. Isn’t one of the main reasons for removal of the crossing to relieve congestion. With all the extra shops, restaurants and apartments it will be replacing one problem with another. Remember the angst about whether the Dorothy Ave underpass would be removed? Eventually it was announced that the grade could be increased to 1 in 40 and the underpass could remain. Much relief from the locals. Now it is apparent that about 200 metres of the track are being put under a deck. Clearly there was never any question about whether you could build a ramp – with a much gentler grade – and retain the underpass. What was actually the question was whether you could put in a viable deck, a ramp, and retain the underpass. When it was decided that you could, it was announced that the underpass would be retained. Interesting theory there – the pieces certainly add up. Will this extra long deck make the new station dark and unattractive like Box Hill? It would be nice if some daylight were part of the design, for example skylights or a gap on the eastern side. I went through there the other day – the deck is away from the platforms, so Ormond station will just be unattractive. Ormond is a poor choice for the following reasons: 1/the apartment block would overlook a heritage area with strict building rules. As a resident, we chose to buy into a reasonably expensive small pocket of authentic housing and deal with restrictive heritage overlay rules. 2/ vertical tower would overlook this heritage area even more due to the topography – station is in land higher than 3 heritage streets below (west) making it even more overbearing ( and taking away all morning light). 5/ highest building nearby is 4 stories so why???? 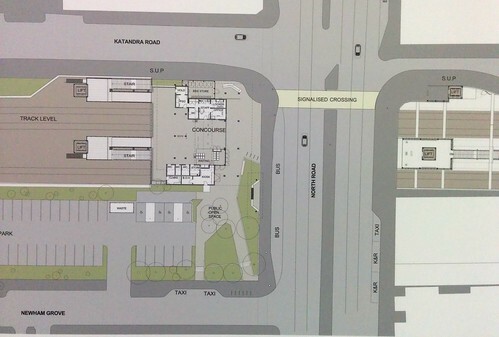 6/ Bentleigh, centre road, has all shops so build it there! Or glenhuntly road as both have no heritage streets..
7/ why not build it horizontally IE have it 2-3 stories but longways. Put rooftop park on top. You can still recoup costs. Bullying their way into an area is anything but democratic!! I share exactly the same sentiments as Emmie. This is unacceptable that Daniel Andrew thinks he can bully his way into our suburb and ruin the area. The council sits there gleefully rubbing their hands cannot wait to collect more rate payments. The residents require to come together very quickly and begin the objection process. Such similar inappropriate developments have been shelved in other suburbs and can be done here too.